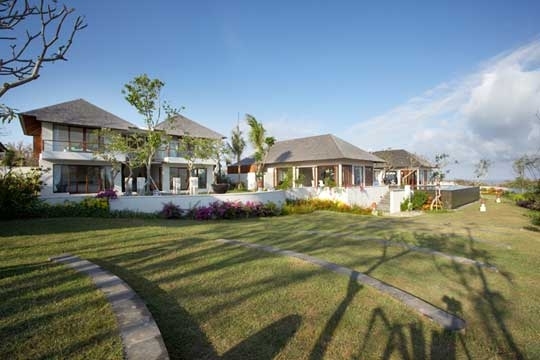 With ocean views from its cliff-top perch, three pools, spa, gym, home theatre, and a full complement of staff, The Shanti Residence is a fine holiday destination for families and friends. 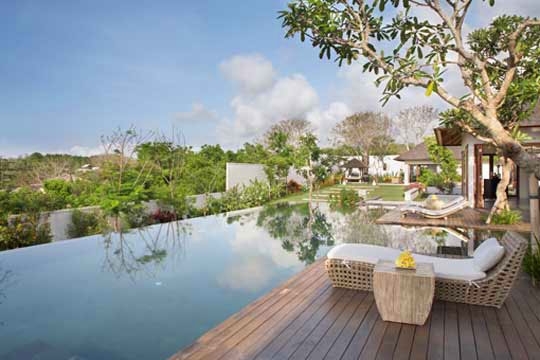 Peacefully positioned on The Bukit Peninsular, this 5-bedroom palace of taste and refinement is a veritable shrine to relaxation. 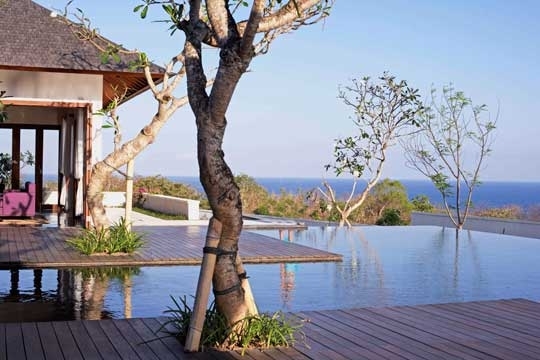 Shanti means peace, tranquility, or bliss in the ancient Sanskrit language and here, atop a hill overlooking the Indian Ocean a few kilometres south west of Nusa Dua, all three are ripe for the taking. The majestic five-bedroom Shanti Residence is a regal retreat; classic, contemporary, enormously spacious, and fit for a king. Sleep in the Ambhara suite and you’ll feel like you’re in a private apartment within a petite palace, with your own views, sitting room, terrace, plunge pool and balé (relaxation pavilion). Choose the Aastha suite, also with a private sitting room, and you’ll have a little corner of the garden to call your own, complete with a jacuzzi and balé. 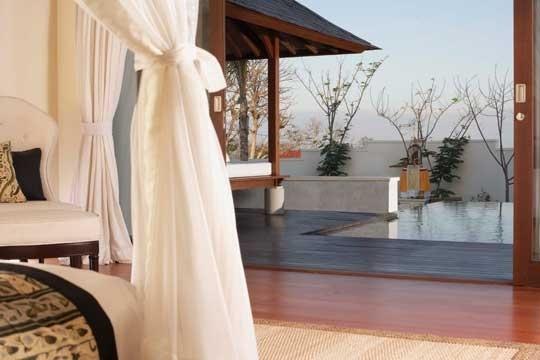 Alternatively, opt for the Abian suite with its surprise garden and plunge pool, or the Akansha and Ananta suites with their balcony lookouts for your own view of paradise. Wake up and work out in the gym (if you must) and then laze your day away by the main pool being waited on by your personal butler while absorbing the views of the ocean, the flower-filled garden and the gregarious white-collared kingfishers that come to rest in the branches of a poolside tree. Enjoy afternoon tea in the living room, indulge your aching limbs in the spa, and feast on the chef’s superb cooking at an alfresco table on the deck or within the more formal ambiance of the glass-sided dining room. And at night, sink back with a movie projected onto the wall in the home theatre, before yielding to a four-poster bed under a canopy of snow-white netting. Do it all again the next day, or change your routine by making use of the complementary service of the residence’s car and driver to visit the nearby beach, the shopping mall or art gallery at Nusa Dua, or the watersports’ coast at Tanjung Benoa. Did we say fit for a king? Rest assured, while The Shanti Residence is indeed worthy of its royal status, it is equally suitable for a family of commoners or a party of friends. Meals can be selected from a fixed price menu (on guest account), while daily breakfast and afternoon tea is inclusive of the price. Classic, contemporary and fit for a king... or even a couple of queens. 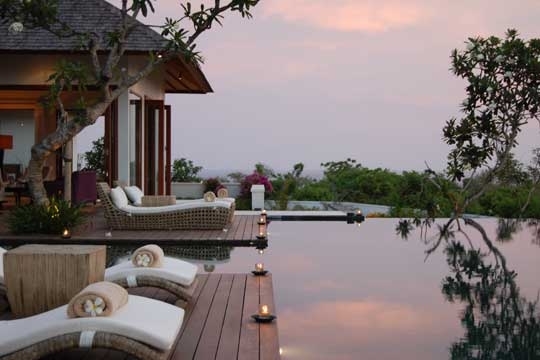 We’d heard some pretty tasty things about The Shanti Residence, so we arrived with great expectations. And this is what we found: the beds were soft, the sky was blue, the sun warm and the hospitality generous. After a delicious night’s sleep in a regal bed, followed by a sumptuous breakfast, the pool and its sun loungers were about as far as we managed to get for the lion’s share of the day. The staff were professional and, more importantly, readily on hand to bring us cold drinks, lunch and complimentary afternoon tea as we lay there soaking up the sounds of birdlife and views of the distant horizon. That night the kitchen produced a particularly tasty meal for us, which left us fit to bursting. 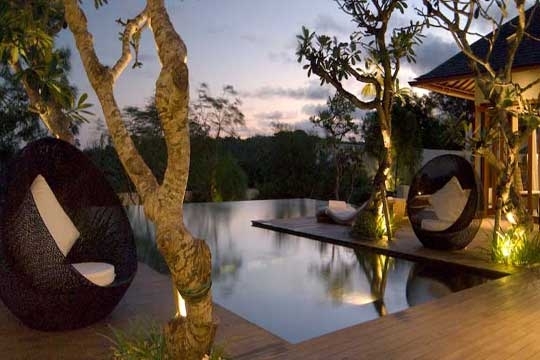 Yes, cloaked in privacy and surrounded by greenery, this stunning villa nigh on forces total relaxation from its guests. Overlooking the sea, far, far away from the crowds, with three pools, a home cinema, superb staff and a tantalising menu of foods and wines, The Shanti Residence requires no leaving. So, bring your favourite books, toys, sunscreen and lover, and get ready for the stay of stays. Notwithstanding the three pools (four if you count the jacuzzi), the views, the great staff and a home cinema that will rock your world (in a good way), The Shanti Residence is simply a beautiful place to be. None that we could find; although hearing the ocean just over the cliff is a bit of a tease when the nearest beach access is over two kilometres away by road. We had six adults and three children in our family. 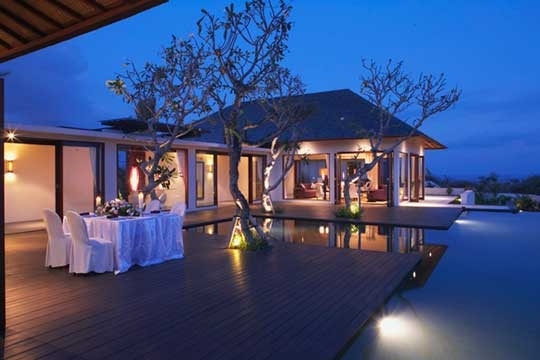 We first searched through hotel resorts, however, none offered large enough pool villa for the entire family. 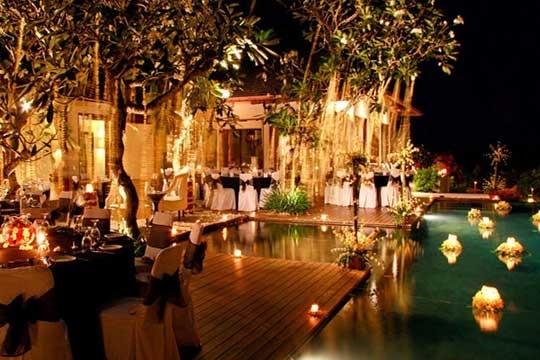 My buddy in Jakarta introduced me to Marketing Villas who was able to offer me an extensive list of private villas large enough to accomodate my family. 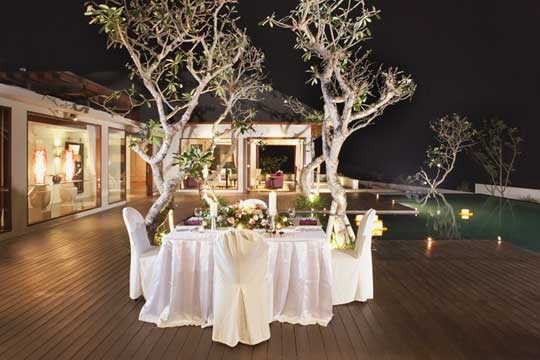 My final pick was the Shanti Residence because I wanted to stay in Nusa Dua. 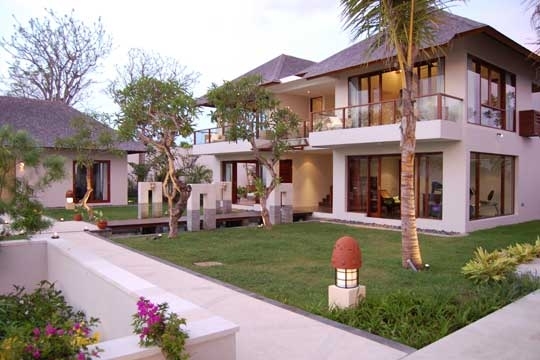 The villa is located in a very quiet neighborhood with a great view overlooking the Indian Ocean. The entrance is well guarded by security personell. The property is much better than what you see in the pictures on their web. You get five suite rooms with more than enough space, three pools, a well-equipped video room, a spacious living room with free WIFI connection, a large dining room, and so much more. The offer an extensive menu offering both East and West cuisines. We tried a number of different dishes and they were all above average (if you want to dine out, St. Regis is only 5-minute drive away). Staff is very helpful and attentive to your needs. The only downside was that the exercise room was not well maintained - the running machine didn't work. Other than that, staying at the Shanti Residence was an amazing and unforgettable experience for my family. I will definitely go back. 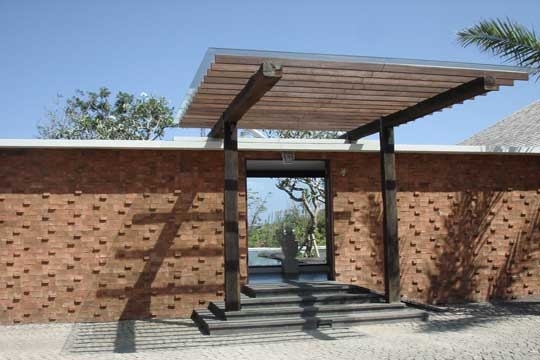 The Shanti Residence is pretty isolated with nothing of commercial interest in the immediate vicinity. There is a sleepy village nearby with a small local store, but not really within walking distance, so if you are craving sugary treats or a packet of cigarettes then just send the butler out shopping. Slightly further afield (2km) is Geger Beach, which is the site of a massive building project, and a little further on (6km), the five star resorts, restaurants and shopping facilities of Nusa Dua. 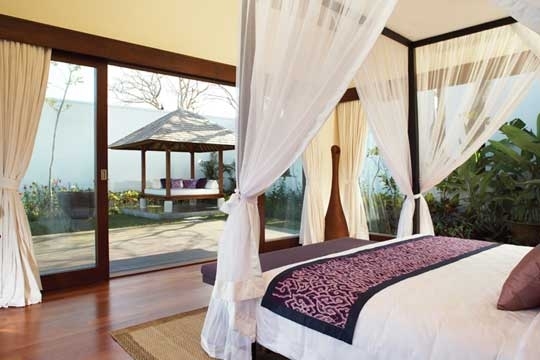 There are five regal bedrooms at The Shanti Residence, two upstairs and three down. Each has a romantic four-poster king bed and is equipped with air-conditioning, a ceiling fan, and a satellite-channel TV/DVD player. 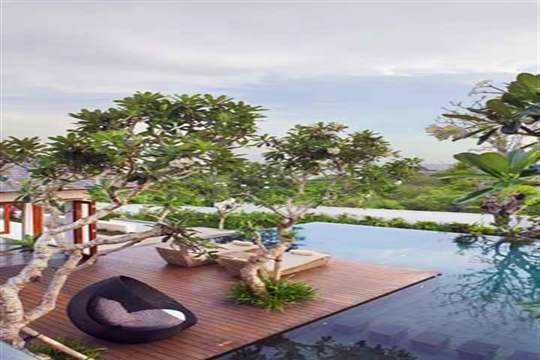 Each is complemented by a dressing room, an ensuite bathroom with a walk-in monsoon shower, bathtub and twin washbasins, and a balcony or terrace offering a real sense of privacy. The bathrooms of the three downstairs suites have garden showers within pretty walled courtyards. 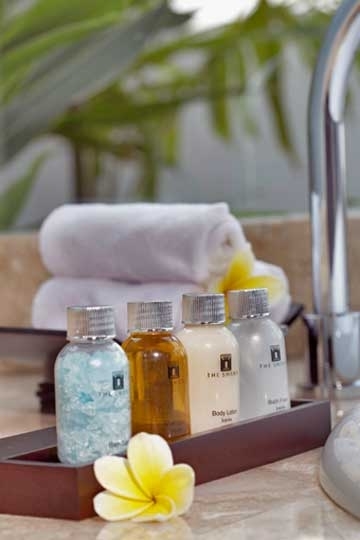 Situated at opposite ends of the property, heralded by pergolas draped in cascading white-flowering thunbergia, the Ambhara and Aastha suites also boast private air-conditioned sitting rooms and relaxation balés alongside a plunge pool (Ambhara) and a cold jacuzzi tub in a private corner of the garden (Aastha). The Abian suite also has its own private plunge pool. 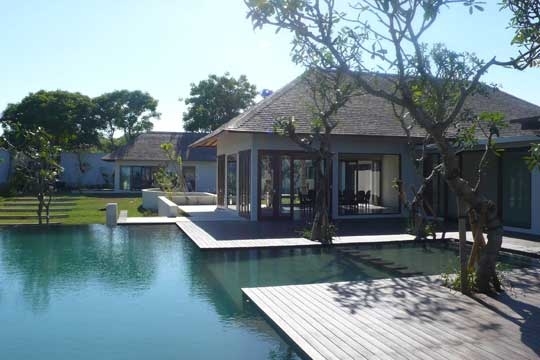 The spa and gym (and three of the bedrooms) are accessed via a wooden walkway over a fishpond and an avenue of waterspouts. 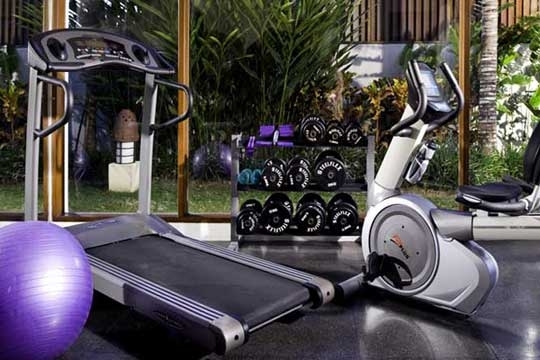 The gym is equipped with a running machine and a rowing machine, and the spa with a massage bed, soaking tub, indoor and garden shower. In the home theatre there’s plenty of room for everyone to gather and watch satellite-television channels and DVD movies projected onto a white-painted 3.5 x 2.5m screen on the wall, enhanced by surround-sound. This spacious-yet-cosy air-conditioned room is furnished with a sofa, four chairs and a toe-pleasing rug on the parquet floor, and equipped with blackout curtains and blinds. The air-conditioned living room is furnished with two large sofas, arm chairs and coffee tables, and characterised by glass doors on three sides that fold open to the terrace and pool deck inviting the outdoors inside. A glass-walled corridor with large mirrors to reflect the garden, pool and sea view leads to the dining room, which is the same size, shape and style as the living room and furnished with a table for twelve. Finally, a large timber pool deck planted with four frangipani trees and furnished with sunloungers and two outdoor dining tables, borders a 16m swimming pool with a shallow section (great for children, or for lazing). 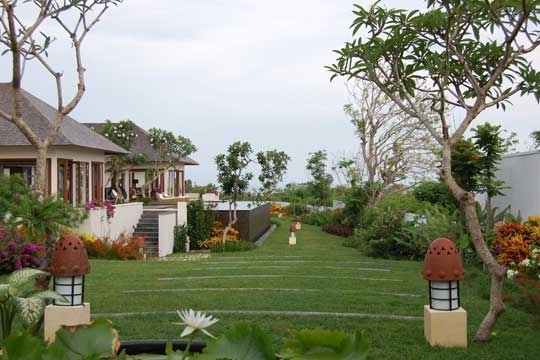 The colourful flower-filled garden is planted with trees and shrubs and stepped lawns, ideal for kids to run around in, and punctuated with ponds, terraces and private areas. 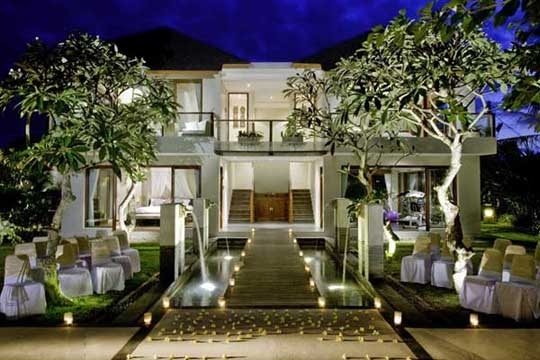 5 bedroom villa located in Nusa Dua, Bali. Ideal for Beach in ten, Bring the relatives, Kid friendly, Going for golf, Spa sensation, Sensible for seniors, Room with a view, Perfect for weddings. 9 out of 10 based on 2 user reviews.